Can you imagine the close quarters and confinement of running with the same twelve disciples’ day in and day out? Do you feel that heavy, claustrophobic feeling of walking the same dusty roads, riding the same boats on the same waves, eating at the same table, visiting the same houses? Imagine being Jesus around the clock with these, less than perfect followers. He not only had to watch their imperfections and idiosyncrasies, He knew their thoughts. He could hear their minds ticking, their doubts brewing, their fears rising. Imagine knowing everything your friends and loved ones ever thought about you, knowing every mistake they would ever make? Talk about information overload!! What if you knew every little grumble, dislike, irritation and every betrayal that was to come your way? Did Jesus find it easy to love Peter, who would curse Him, or a Thomas, who would doubt Him? And yes, there was Judas, the one who would betray Him to His death.. What a motley crew Jesus chose to hang out with. Talk about biting the hand that feeds you. What was Christ thinking? Have you been cursed, doubted, or betrayed by a friend? Relationships are difficult to manage, because individuals are so in our face with their oddities and selfishness. As they are, we are likewise set in our own odd, selfish, arrogant ways. How impossible it is for us, sometimes to get along. Jesus did it, How? Let’s ponder His forgiving heart as we catch a glimpse in John Chapter 13. Enter Jesus into the upper room, just before the Passover Feast. He knew His time had come, it was soon time to leave His friends and depart to His Father. He had come to serve and love and now He must show the full extent of His love. The day had been long, the sun warm, and the journey endless. Watch as the weary, exhausted disciples enter one by one, taking their places at the table? Do you see the towel on the wall, the pitcher and basin on the floor? Not one of them volunteered to deal with the dusty, tired, weary worn feet of the attendants. Anyone could have filled the role, but no one did. After all, the washing of feet was a task reserved, not just for servants, but for the lowest of servants. The servant at the bottom of the ladder was to bow the knee in humble service offering refreshment in a cool water foot bath. Jesus knew what He had to do as an act of demonstration of His love to these, His followers, His friends, those who would curse Him, doubt Him and yes….betray Him unto death. One grimy, dusty foot after another, Jesus worked His way down the line. Cleansing feet that would be disloyal to their Master. Feet that would not even follow Him, to defend His cause, over the next twenty four hours. These same feet would run into hiding at the flash of a Roman sword. Judas, wouldn’t even make it past the evening meal, but yes…Jesus washed his feet, with the same loving heart that loves us and the same loving hands that would soon be pierced and lifeless. Can you imagine, the moment, the feelings, the thoughts as Jesus lifted His betrayers feet gently into the basin? Within hours these same feet would rush off to betray his Master for thirty pieces of cheap silver. Jesus knew all that was about to happen. He knew they were about to be involved in horrendous events that would make them hang their heads in shame, and look down at these same feet in guilty remorse. At those moments, in each of their lives, His desire was for them to remember how He knelt before them in love, washing their feet, in that cleansing moment. What a gift He gave, as He forgave their sin before it was even committed. What a priceless gift He gave when He offered mercy before they even sought it. Isn’t that just like Christ to dip into His basin of grace to lavish us with mercy, for the sin He knows we will commit? Although we aren’t those twelve disciples, our story is similar in the now and what Jesus did for them He still does for us through His shed blood. 1 John 1:7 says, “Then the blood of Jesus, God’s Son, cleanses us from every sin.” What a precious gift to receive that cleansing in spite of our oddities, and selfish arrogance. In spite of our negative thoughts, irritations, and betrayals, this cleansing is present in the here and now, not a pie in the sky promise if we tow the line, perform to the “T”, or reach some measure of success. The cross, Christ’s death, His shed blood and victorious resurrection has made atonement possible for us, as it covers our “now” sin and keeps on cleansing us to victory!! Whose feet do you need to wash? Oh, you haven’t done anything wrong? You’re not the guilty party? You haven’t cheated, you haven’t lied? Perhaps it’s true! 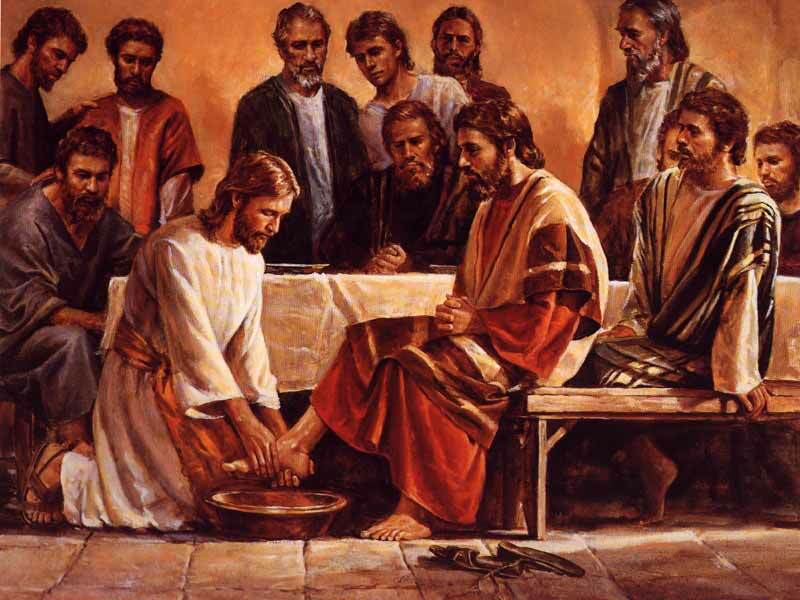 It was certainly true for Christ, and of all the people in that upper room He was the only One worthy of a foot wash, but He was the One who stooped to wash. Imagine that! The one worthy to be served, served others. Is there something wrong with this picture? No,…for sure not! Take a look at it. This is profound to me!! The brilliance of Jesus’ example is clearly depicted here. The burden of mending or bridge building in any broken relationship falls on the strong one, not the weak one. The one who is innocent is the one who makes the move, the one who offers the kind gesture. What an awesome chain of events, when the one in the right, volunteers to wash the feet of the one in the wrong through kindness and love. See this with me now, both parties will then bow the knee to wash the feet, to serve the other. To be kind, gracious and loving, because WE ALL think we are right. What a beautiful picture of the humility of true forgiveness in serving others. Relationships don’t thrive because the guilty are punished, but because the innocent have mercy. How profound and amazing is this thought? Wow!! Let me ask again. Whose feet do you need to wash? So you’re right? That makes you strong. What tangible thing can you do to show kindness to the guilty? The one who has hurt and maimed you emotionally, physically maybe? Possibly belittled, betrayed or isolated you and made you feel like two cents, or garbage. Possibly stolen your zest and motivation, your spark for life? Well, there’s a towel on wall for you. Do you see it? The pitcher and it’s basin rest on the floor, waiting for you to pick them up. To fill them with cool, clear water. Dip into the basin of grace and pull out a palm of refreshing mercy to wash the weary, dusty feet of your offender. Follow Christ’s genius example demonstrated in the Upper Room, just before He went all the way to the cross for you. Be blessed this day in your relationship with God and be strong in Christ..Forgive and wash some feet! The above was inspired through Max Lucado!